It’s art for art’s sake, as always, in our world. Starting tomorrow and running through Oct. 12, 2016, “At The Edge,” an exhibition composed of drawings from five Austin-based women artists, will be displayed in the Wright Gallery in the College of Architecture at Texas A&M University. For the first time, the show brings together the work of Alyson Fox, Shannon Faseler, Rebecca Rothfus Harrell, Bethany Johnson and Alexandra Robinson. Each artist brings a unique perspective and objective to her artwork in a range of mediums. “At the Edge” unites these accomplished artists displaying drawings that push the boundaries of the art form. The select works, curated together by artist and exhibition participant Rebecca Rothfus Harrell, examine spatial relationships, manipulation of scale and simplification of forms using a variety of media including graphite, gouache, ink and more. While all pieces represent visual investigations of the everyday and natural world, each artist has a different goal when approaching her art. 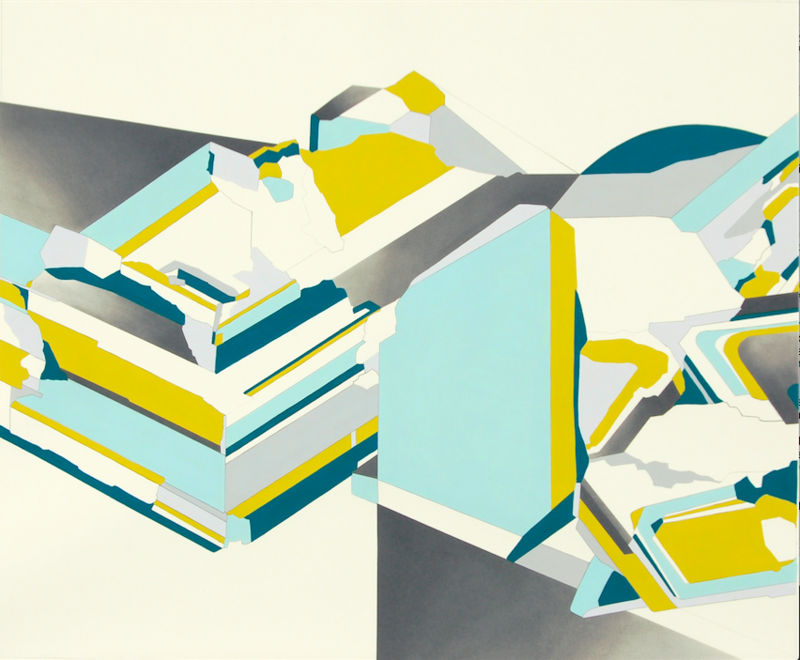 Rebecca Rothfus Harrell, who is represented in Austin by CAMIBAart gallery, creates work that references the landscape and incorporates geologic formations, while simultaneously flattening, abstracting and fracturing the sense of space. Similarly, Shannon Faseler, a lecturer in the Department of Art & Art History at the University of Texas at Austin and Texas State University, uses her work to focus on aesthetics and representation. Many of her pieces are based on climate change and its visual effect on the planet. In a space between science and poetry, Bethany Johnson’s work revolves around the study of systems and the visual representation of information. Her art is represented by the prestigious Moody Gallery in Houston. Johnson is also a full-time lecturer at the Department of Art & Art History at the University of Texas at Austin. Alyson Fox, an established name in the world of textile design, prefers to observe aspects of life that are hidden, attempting to pull them out into focus. Some of her textile designs can be seen through her partnerships with companies including West Elm and H&M. Associate Professor and Art Foundations Coordinator at St. Edward’s University, Alexandra Robinson creates art that investigates internal mental landscapes and outward connections to the land. Her work has an allusive quality with the intent to provide self-reflection and glimpses of clarity along the way. All the artists have an impressive history of solo and group exhibitions throughout the United States, but the Wright Gallery show marks their first group installation. Artist and curator Rebecca Rothfus Harrell worked closely with Texas A&M Visualization Department professor Felice House and art historian and curator Dr. Stephen Caffey to coordinate the collection, another compelling example of the gallery’s mission to serve as a venue for emerging artists from diverse backgrounds. “At The Edge” is the first in a series of exhibition in the fall season for the Wright Gallery. An opening reception with four of the artists is scheduled in the Wright Gallery from 4:30 to 6:30 p.m. on Tuesday, Sept. 20. It is free and open to the public. The artists in attendance will be Alexandra Robinson, Shannon Faseler, Bethany Johnson and Rebecca Rothfus Harrell. Dates and Hours: The installation will be on display from Sept. 13 to Oct. 12. The Wright Gallery is open 8 a.m. to 5 p.m. Monday-Friday (weekends by appointment).